Nothing warms up the soul like a bowl of chili and this recipe’s got heat, that’s for sure. I think I added one too many chipotle peppers in adobo sauce, so that’s your fair warning. I searched for hearty veggie chili recipes and found one called ‘Ultimate Vegan Chili’ and when I saw the use of chipotle peppers in adobo sauce, I knew it had to be good. 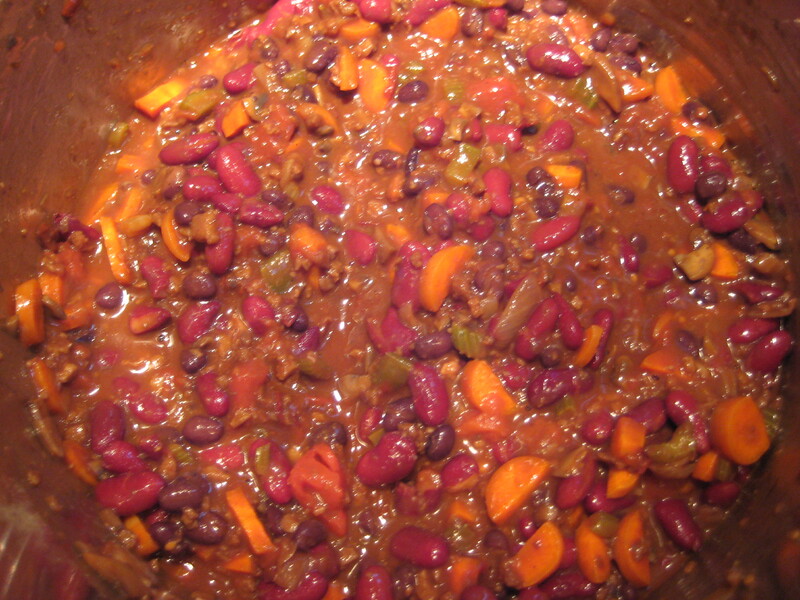 If you like the Spicy Black Bean Soup from my blog, you’ll love this chili. I love it because it is another way to use those yummy chipotle peppers. Remember you can freeze what you don’t use and thaw a bit to use again. Heat the olive oil in a big soup pot over medium-high heat, add the onion and celery and saute until soft and the onions start to brown. Add the garlic and chipotle peppers and cook for another minute, stirring. Add the mushrooms and saute until cooked down and liquid is released, about 4-5 min. Add the veggie round, tomato paste, paprika, oregano, chili powder, salt and water, stirring occasionally, for 4-5 min. 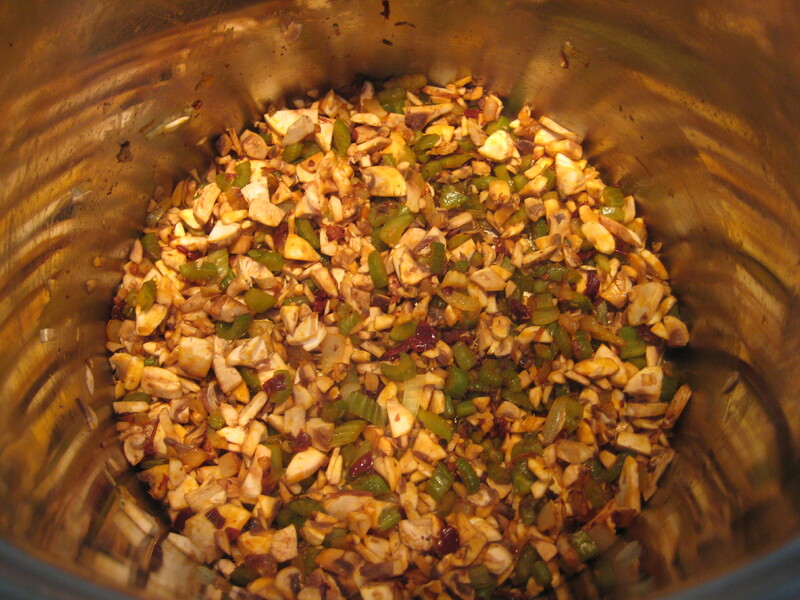 Add the rest of the ingredients, cover and reduce heat to medium-low. Simmer for 1 hour stirring occasionally. 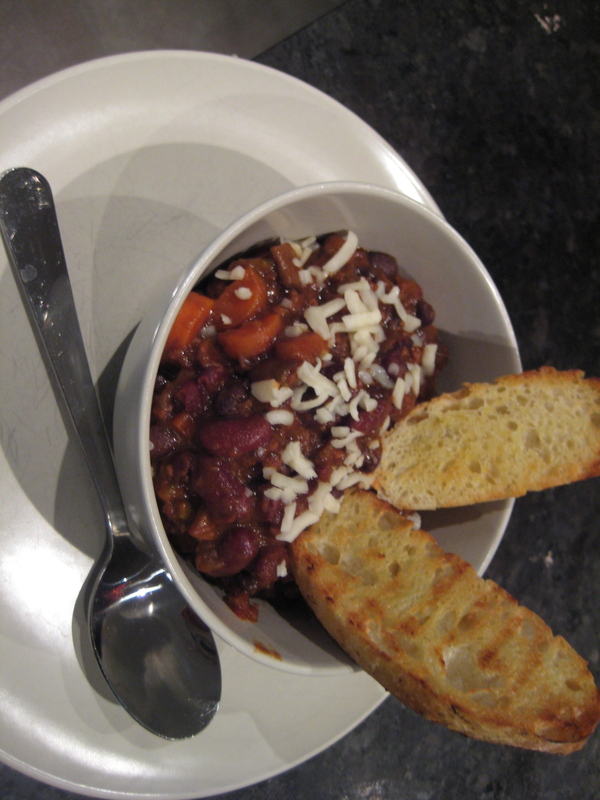 Chili is ready when carrots are tender. Serve with slices of a toasted baguette (we love the Turkish bread from Cobbs) and a sprinkle of mozzarella cheese (or your vegan choice).